Fuzzball & Scuzzball - Battle of the Century! Comic 250 - Battle of the Century! Holy socks! Today we're celebrating the 250th episode of Fuzzball & Scuzzball. In the past, I did a special 150th episode (featuring Drip-Drop Man!) and a Great Jumping-On Point for New Readers 200th episode, but after I cut some strips and added some strips the numbering got changed, so neither of them falls in the right place any more. I guess that's why you shouldn't make a big deal about specific numbers? BUT IT MATTERS NOT! Because I am making a big deal about this number. In fact, next week will be a special celebration of this milestone event. 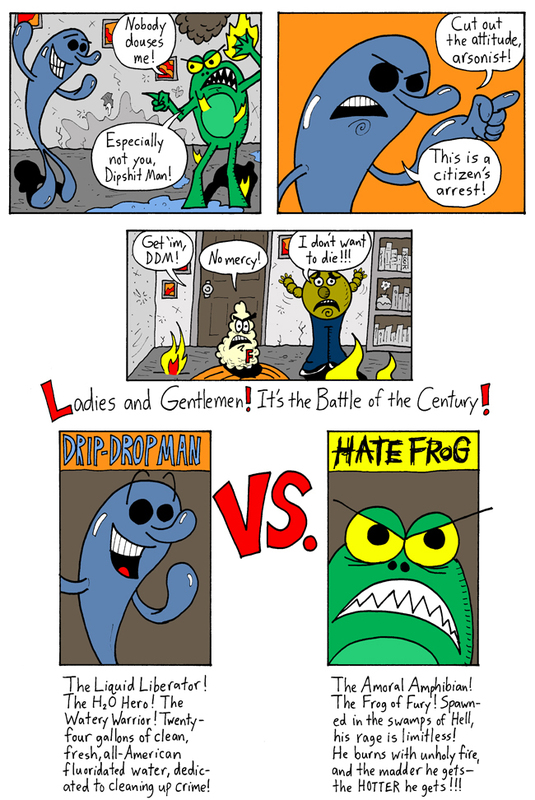 NEXT WEEK:The battle between Drip-Drop Man and Hate Frog begins on Monday, and then rages through the whole week. That's right, for the first time ever, I will be updating daily. Even better, it won't just be me--some very special guest artists will be lending their talents to this titanic tussle! Tune in on Monday to see Fuzzball & Scuzzball like you've never seen it before!